The power adjustment pulse width is a method in which a control device works as a switch that opens and closes many times per second. Switching is so fast that our eyes do not see the flashing (due to the persistence of the retina). However, that manages the device and adjust the power modifying the average between driving time and which is open ("duty cycle"). The adjustment system pulse width has the great advantage that is very efficient because the control device waste very low power (and therefore little hot). The reason is quite simple: the power dissipated in a device is the current passing through it multiplied by the voltage drop at its terminals. 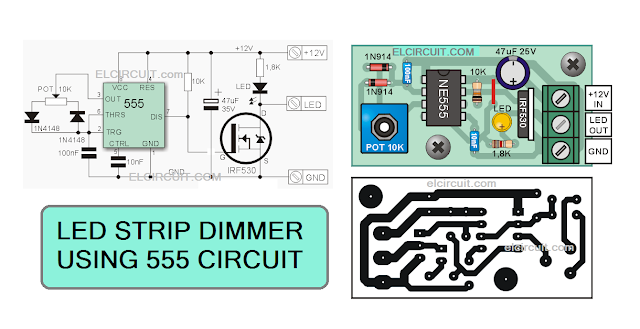 Therefore, in this type of dimmer, while the device stops all current pass, the voltage drop is minimal (about 0.7V with a current of 4 A) whereas when the voltage is high (12V), the current is zero, ie no power dissipation. 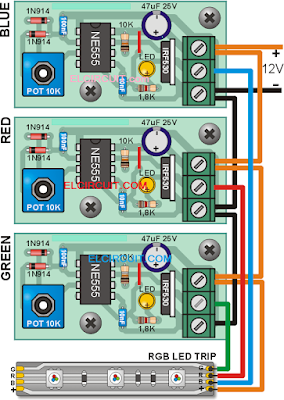 For a good system of dimmer by pulse width you need to add a pair of diodes as we can see in the figure. These diodes cause, according to the position of the potentiometer, the 100nF capacitor charge and discharge at different speeds by modifying the aforementioned "duty cycle". With the values shown, the oscillation frequency is approximately 3 KHz. 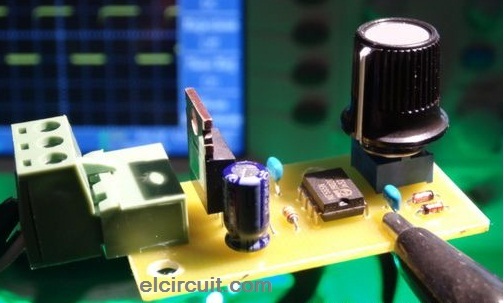 This frequency can be modified by changing the value of the potentiometer or 100 nF capacitor. 555 allows an output current of a few mA, therefore it is not possible to connect LEDs directly. 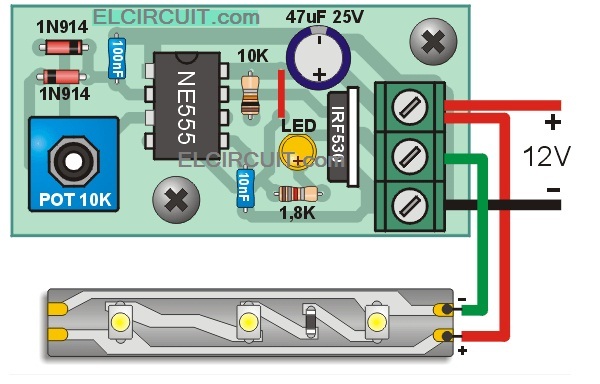 To obtain a high output power must add a transistor of MOSFET type N channel that allows to control very high currents (several Amperes if we put a heat sink). 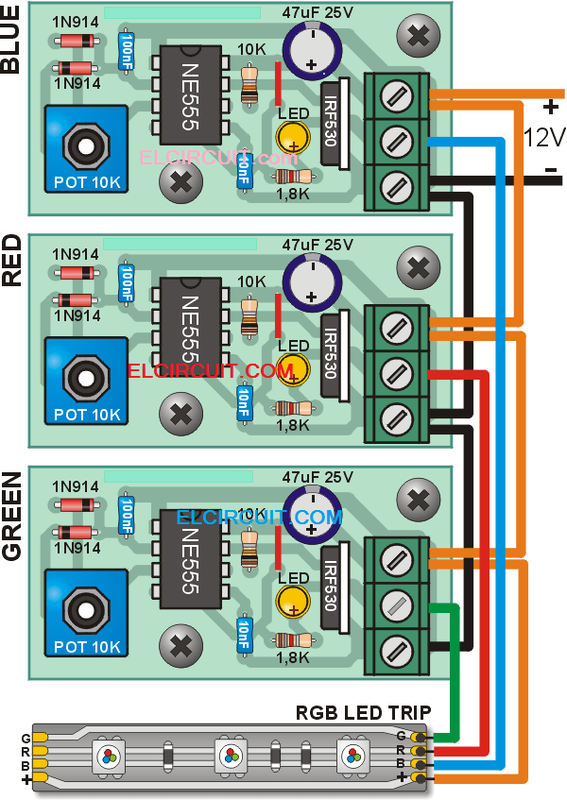 Few who want to control a strip of multicolored LEDs, in the following figure you can see the wiring needed using three identical systems to the one described in this article. 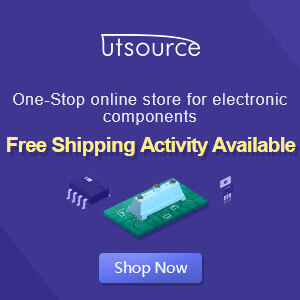 They can mount individual heat sinks or one to three MOSFET. In the latter case I remind you that it is necessary to isolate each other that the metal bodies of the MOSFETs are connected internally to the "D" terminal. Stop Stealing projects from Inventable !!! Thief, this you have stolen from "Inventable.eu"